The Disc-less Life - No CDs, SACDs, DVDs, Blu-rays, or Vinyl Records!!!!! This thread serves as a consolidation and reference point to my other threads covering the transferal of my disc-based music and movie collections to server-based streaming systems. 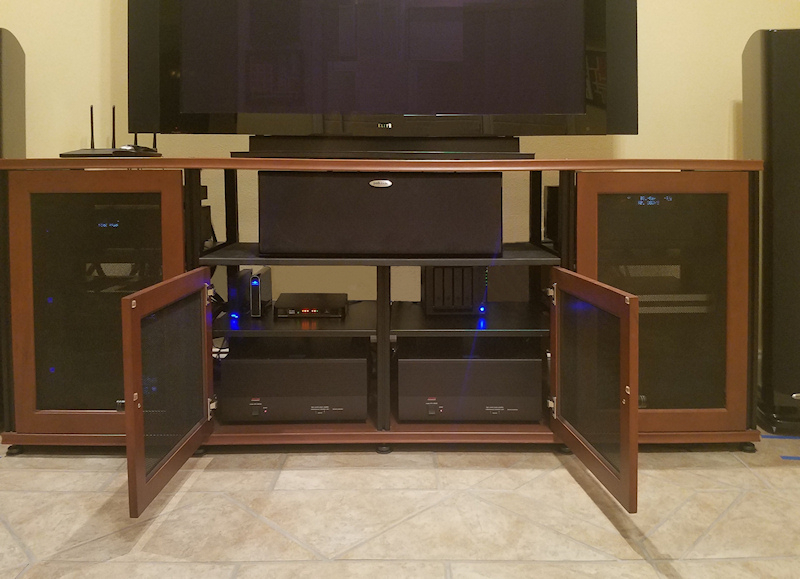 I completed my vinyl to DSD conversion project in February of 2017, ecstatically put my turntable in a closet...and never looked back. "They" said I would miss vinyl, but "they" really didn't know me and how much I viscerally despised the playback inconveniences and cyclopean maintenance issues associated with vinyl playback. Even if I was one of "them" that enjoys the playback and maintenance rituals of vinyl, there would be no practical reason for further indulgence because the digital rips of my vinyl records sound better than the records. Figure 1. Whenever I need to convert a record to digital format, I set up this conversion rig. Figure 2. Sweet dreams, luv. When the antiquated "Rube Goldburg-ish" turntable/vinyl digital conversion system contraption is not in use, it is stored in a closet, out of sight and out of mind. A long time ago I discovered that mechanical drives are from the Devil. More recently, I discovered that my entertainment media sounds and looks better when it is not played from a warped, wobbly, rickety plastic disc rotating in a relatively unstable turntable contraption or optical drive. I am not completely disc-less. Most of my audio and video media reside on spinning hard drive platters. However, hard drives are far more rotationally stable and less prone to data error than the typical expensive turntable or optical drive playing physical media...which is prone to dirt, dust, warped surfaces, worn surfaces, scratches, and a host of other nasties. Even more than that, reading data from a magnetic disc avoids the optical to electrical conversion issues of optical media and the acoustic to electrical conversion issues of vinyl records. When solid state drives become more affordable and available in the multiple terabyte sizes I require, and if such drives offer the same or better audio and video quality performance as disc drives, I will abandon disc drives. Table 1. 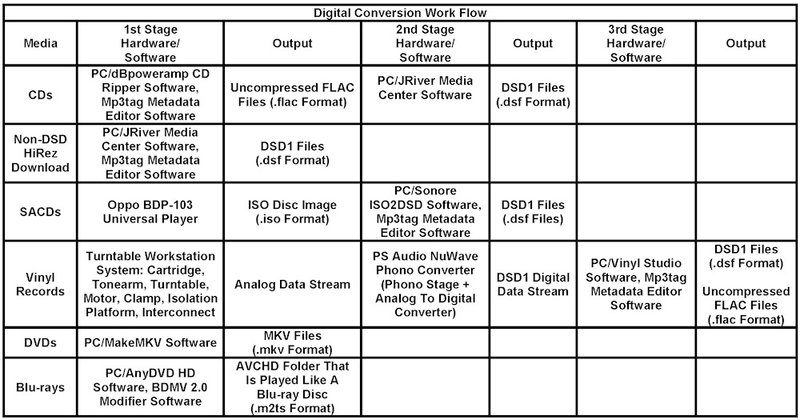 Digital Media Conversion Work Flow. 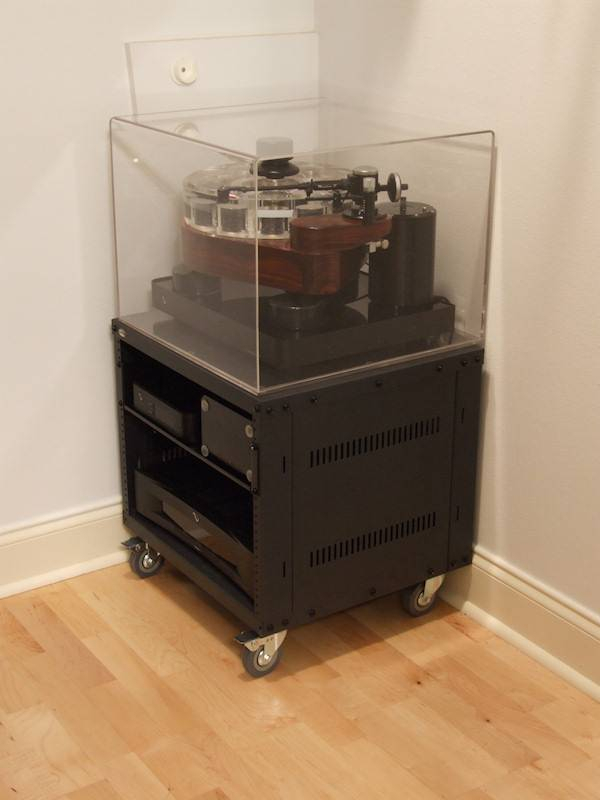 It was quite a revelation hearing how much better my records sounded when they weren't subject to the masking effects of the loudspeakers pounding on the cartridge, tonearm, turntable platter, and the record itself. It was also a revelation seeing how much better my movies looked when played from a hard drive rather than from an optical disc. The current state of digital playback facilitated a sea change transformation in the way that I use and enjoy my entertainment media. This was particularly true in the case of my vinyl records, which were no longer home bound and locked on 7 inch and 12 inch plastic discs. My records, as are all my entertainment media, completely portable and playable on a variety of playback devices...including my cell phone. When traveling, I take some of my favorite music, in FLAC format, and some of my favorite movies, in either MKV or m2ts format. 1. I can conveniently listen to my vinyl records every day, whereas they used to be a "special treat of a few hours each month. 2. All of my entertainment media is accessible in every room of the house that has the appropriate audio/video streaming equipment. 3. Now that my movies are at my fingertips, and not sitting in cases in a video rack, I find that I watch more. Pulling movies from a server is particularly well suited to the way that I often watch movies: sometimes I only want to re-watch my favorite scenes in several movies. This used to be a chore when my movies were disc bound. 4. I remember my days of running back and forth to the turntable and CD player, runing back and forth to the CD/SACD rack, running back and forth to the DVD/Blu-ray rack, fiddling with jewel cases, movie cases, tight cardboard CD sleeves, and album jackets, and handling vinyl records with kid gloves, the same way that a wrongfully convicted man remembers his years in prison. Figure 3. Such Good Video is facilitated by pulling data off the server (Synology DS918+ NAS) rather than off a little silver disc. Figure 4. The Synology NAS (middle shelf right) can store thousands of DVD and (2K) Blu-ray movies. Thousands more can be accommodated with one of Synology's 5, 8, or 12 bay expansion units. Figure 5. 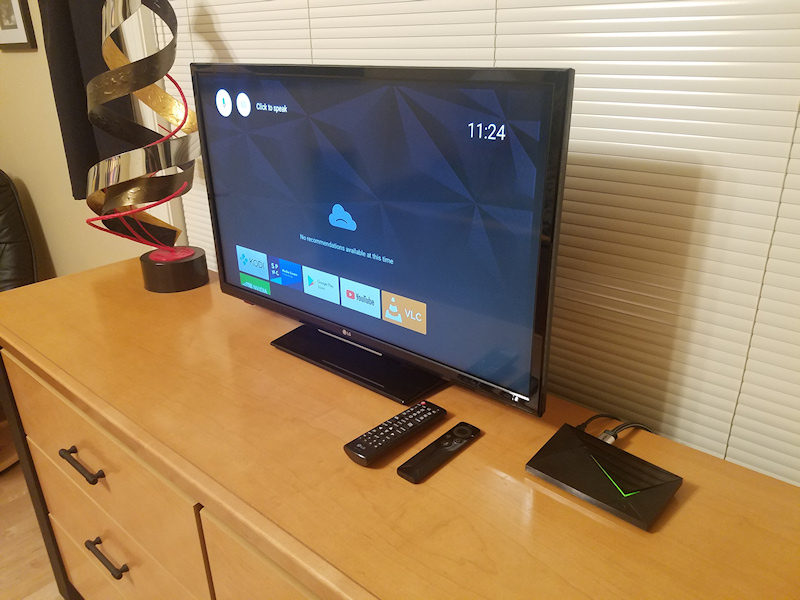 In guest bedrooms, access to the music and video servers is via nVidia Shield TV digital players. Figure 6. Such Good Sound! In addition to the convenience and portability aspects of transferring my entire music collection to a server/hard drive configuration, there was the unexpected benefit of improved sound quality. I wish I had the time to pull that off, I would love to do that, I have all my CD’s to a SSD but not a DSD conversion.. The time commitment caused me to put it off for a long time, but I eventually reached a point where my aversion to disc-based playback became much greater than my aversion to the time commitment. Sweet, and I'm glad you're happy with the results. So when are you gonna sell off your hard copies? I am extremely jealous, good job, absolutely beautiful! So when are you gonna sell off your hard copies? 1. I like having the original physical media as backup because I might want to re-rip something in the future, particularly if a better format becomes available. 2. I need the phyical media on hand in case the DRM (Digital Rights Management) Gestapo ever gets government approval to start doing random home invasions inspections looking for pirated media. Love your threads @DarqueKnight ! Truly an inspiration. One question, do you make a back up copy of the converted digital files? In case the Synology decides to, well, go down? Just want to say thank you! I've used your threads as a reference to rip all of my cds using dBpoweramp, and I'm in the process of digitizing about 500 albums using the PSAudio NuWave Phono Converter. One question, do you make a back up copy of the converted digital files? In case the Synology decides to, well, go down? Yes. Onsite and offsite backups. 2. I need the physical media on hand in case the DRM (Digital Rights Management) Gestapo ever gets government approval to start doing random home invasions inspections looking for pirated media. They wouldn't be able to do so. Just about any song you want can be gotten on You Tube. So unless they decide to shut them down, they can't touch anyone. My cd player drawer on my pc no longer works, so I simply go to You Tube and pull the songs I want from my CDs off of there. I'm kinda of 'half in/half out.' I use JRivers but have been a tad lazy. 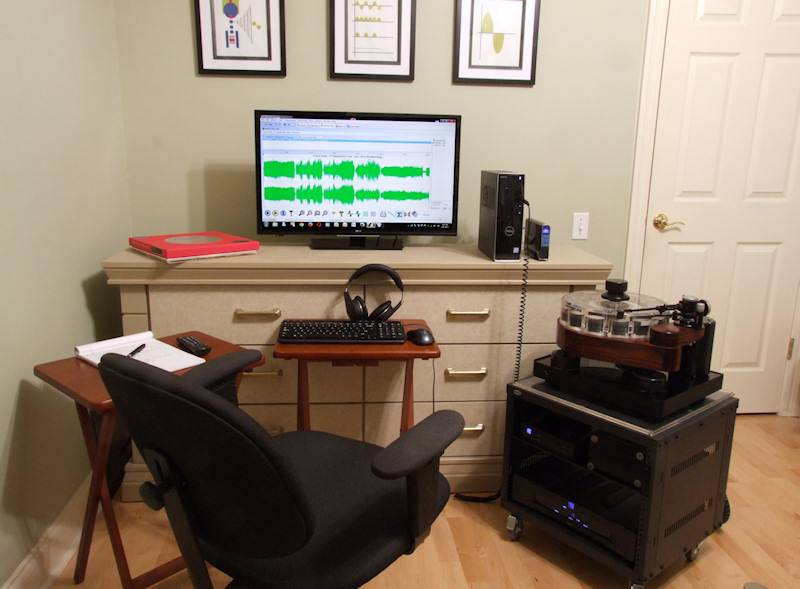 Have about 85% of my music ripped to files (either FLAC or WAV) but reading Darque Knight's posts, sounds like there is optimization to be had to go to DSD file format. I haven't ripped any of my movies though. I was always waiting on the latest/greatest S/W to become available to make it worthwhile. In the mean time I've been using the direct media DVD (upscaled) and Blu-Ray 1080p... on a Panasonic Plasma, which I've been happy with. As for my NAS.. been using an older 8 bay Drobo...It has some admin advantages for RAID configuration, but I probably need to update my older HD's when I decide to rip my movie collection. 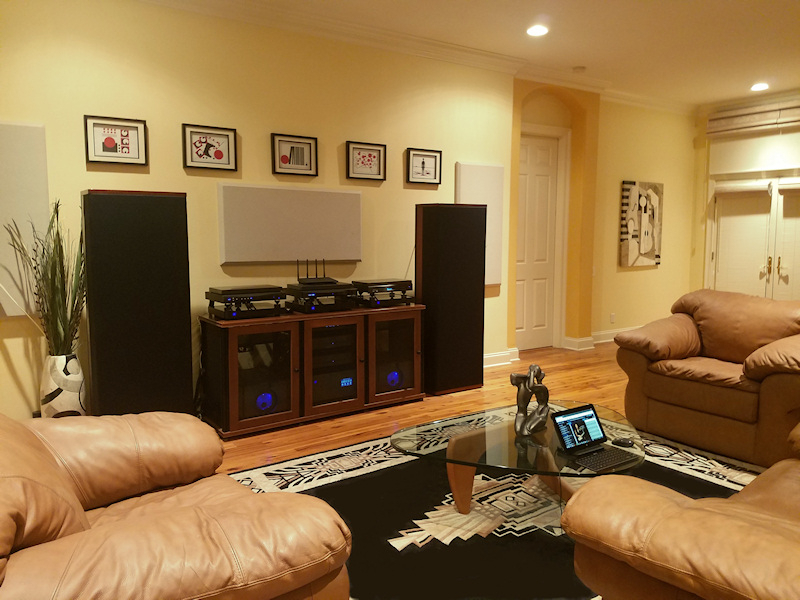 So right now, I feel pretty good about my audio set up (though I need to complete ripping my CD's)... still need to consider whether to move everything to DSD format. Still on the fence about ripping all my movies (about ~500 DVDs at this point). We'll see. ... but reading Darque Knight's posts, sounds like there is optimization to be had to go to DSD file format. Yes, the DSD conversions sound better. However, I keep a FLAC and a DSD version of the each song file because FLAC is more portable (playable in rental car stereos, etc.) than DSD.